Click on the question to get the answer to it. 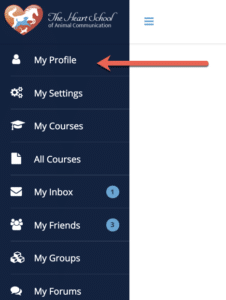 How do I find my stuff (my courses or club membership)? After you have logged in click on the “My Courses” tab on the left-hand side menu. All of your purchased courses or memberships will be stored for you there. Click My Courses and then scroll down to see what you “own”, then click that to open the Course and go through the lessons and modules. 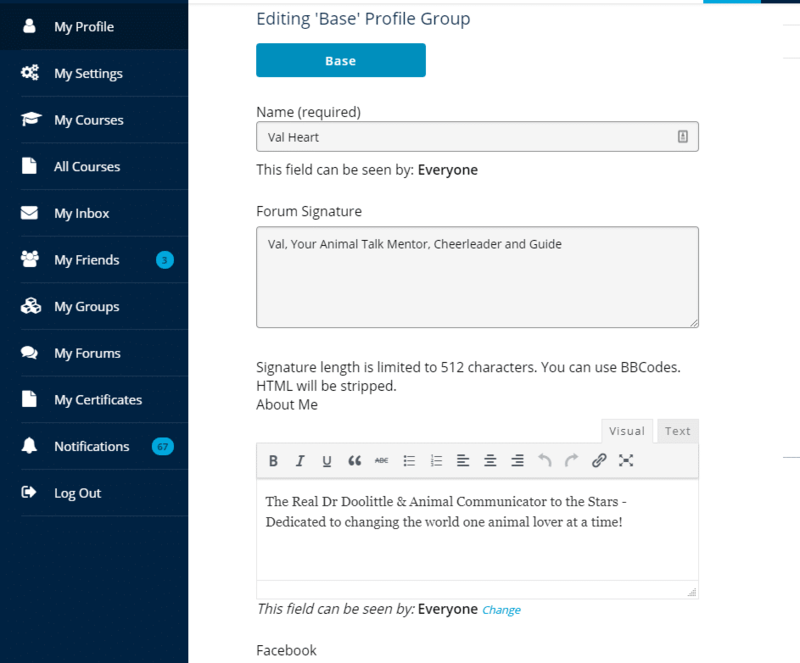 What's the difference between My Courses and All Courses and My Groups and My Forums? All Course tab will list ALL the Heart School courses available for purchase as well as your courses that you have already invested in. My Groups tab is for Student accounts. Here you can communicate with other students. Post any questions or thoughts you have. My Forums tab is for Coaching Club Members only and is where you can find the Forum with active discussions, conversations with animals, and lots of other great topics for Coaching Club students! How can I access my Bonuses? Click on your Course and scroll down to the bottom of the page, you’ll see the Bonus Trainings Box, click on the drop-down menu to view and access the bonuses. Once you’re in that section you’ll see that you can edit your name, signature and about me section. Update that and click Save. Inside Edit you’ll also see an option to edit your profile picture. We recommend you update that to a picture for other students to get to know who you are! The next step will be to update your Cover Image. Update it with any picture that shows other students things or a picture you love! How do I earn points, and what do I do with them? 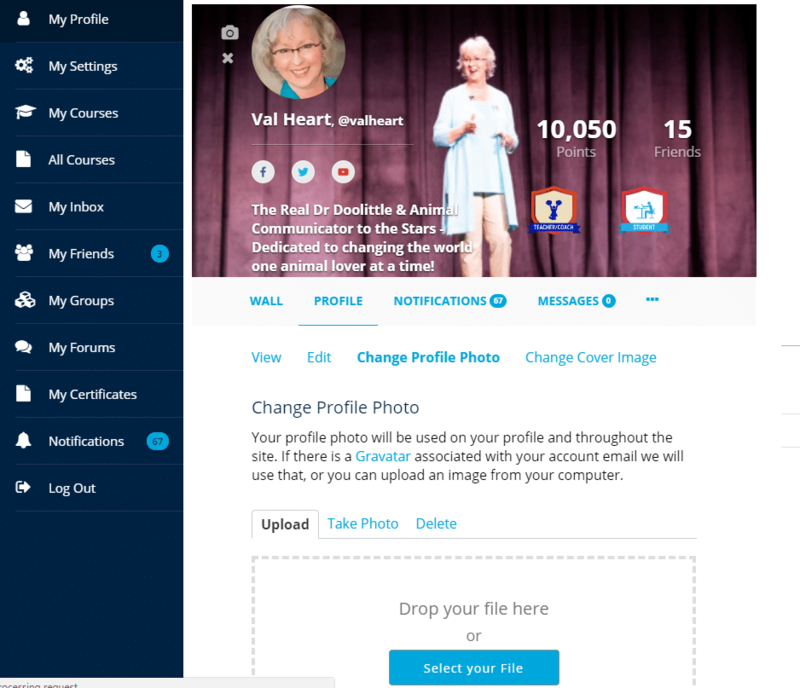 The Heart School awards student’s points for various activities, like logging in for the first time, posting to active discussions, getting courses, completing courses, taking quizzes, updating your student profile and more! Or you can click their name to learn more about them. You’ll see on their cover picture that lists badges and name. There will also be a blue box that says “Add Friend”. Click that box and a friend request will be sent to them. Once they accept your request you’ll see them listed under your friend’s tab. Your assignment this week is to Make 10 New Friends (or more, you can never have too many friends, right?!)! From there you’ll get to know their animals, and they’ll get to know yours… you can ask them questions or find ways to help each other, you can discuss your love of animals and help each other grow, heal and evolve your skills too! How can I find someone to practice communicating with? There are multiple ongoing communications within the Forum discussions. A great place to start is with the Featured Animal Teacher (FAT) of the month. You practice communicating with that animal, post your findings with that discussion string in the Forum and hear back from the animal’s person. I communicated with someone's animal, but have not heard back from them yet. What should I do? You should message that pet’s person directly. It’s possible they simply missed seeing the post. It’s also possible they are not active at the moment for whatever reason, so if you don’t get a timely response, you should choose another animal to practice with and try again. How do I message fellow students or Val? Great question! Once you’ve logged in and you’re on your profile, see the members area on the right-hand side with pictures and names. 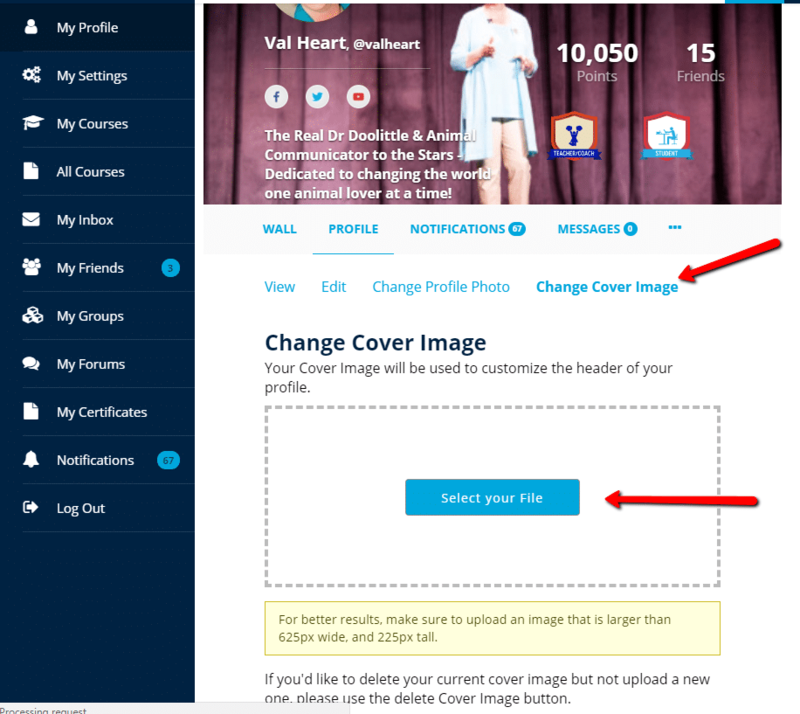 Click on the picture of the person you’d like to message, either Val or another student and it will take you to their profile, in the area of their cover photo you’ll see a box to private message the student if you’ve made friends with them. If you have not done so yet, ask them to be friends! You can also publish a message on their wall on that same page. Your Wall is similar to your Facebook Wall, it will show you threads of topics you’ve begun or have commented on, and other students can leave messages on your wall. How do I sign up for a different level of Animal Talk Coaching & Mastery Club membership? Email [email protected] and my team will take care of you! There are 3 levels of membership designed to support you with whatever you most need and want, at whatever level you are from newbie beginners to advanced students. How are the Club Membership levels different, and can I change if I want to? Silver Members get recorded mini-trainings each month, access to the student community and opportunities to practice. This level of membership is best for do it myself kind of students who enjoy community and opportunities to practice communicating while they continue their training. Gold Members receive everything Silver Members get, PLUS 2 more Bonuses along with new training every month, and can get personal attention by participating in the Monthly Live Q&A Coaching Calls. 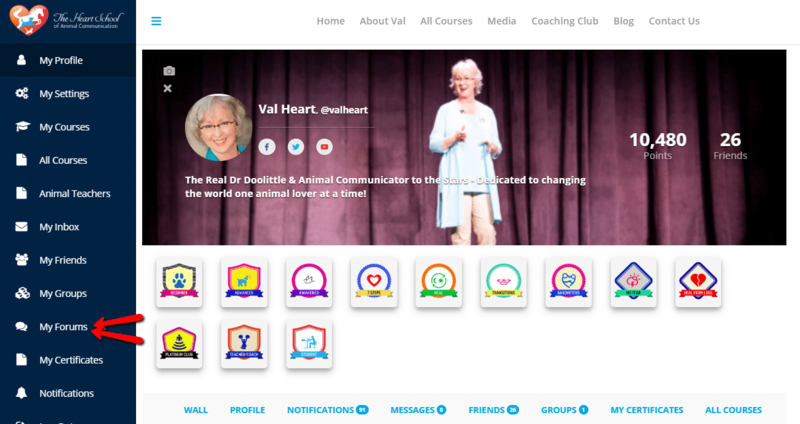 Gold and Platinum members are also eligible to participate in the Featured Animal Teacher game, as well as earn Sessions with Val by practicing Accountability. This level of membership is best for students who want more, who have questions, and who want the experience of doing group exercises and Val’s personal guidance and mentoring while they grow their abilities. Platinum Members receive everything Silver and Gold Members get as well as the opportunity to deep dive LIVE in the extraordinary Masterclass Series Calls. This level of membership is best for students who want it all, who want to dive deep and go faster than they would have otherwise, and who want to advance their skills to mastery. Many of our Platinum members are also interested in becoming a professional animal communicator. If you would like to change to a different level of membership, just let us know! You can upgrade or downgrade at any time depending on your needs. Your billing will be adjusted so it processes on the due date at the new amount. Email [email protected] with Club Membership Change in the subject line. Where do I find the Beginning Course, the Advanced Course or other Specialty Courses? After you have logged in click on the “My Courses” tab on the left-hand side menu. All of your purchased courses or memberships will be housed there. How can my pet be the Featured Animal Teacher of the Month? One of the great opportunities for Gold and Platinum Animal Talk Coaching Club members is that you and your pet can enjoy the spotlight as our Featured Animal Teacher of the month (in the Forum)! All month long your fellow students can talk to your pet, then in the Live Q&A monthly calls, you’ll get to experience a wonderful group communication exercise with them to take this deeper. We’ve seen behaviors change, sick animals heal/feel better, AND all the students who participate report having the most amazing conversations with them. You can see and participate in those discussions in the Forum. Before the end of the month, it will be time to choose a new Featured Animal Teacher. Will it be YOUR pet next? Note: All Club members can join the discussion, but only Gold and Platinum members pets are eligible to be chosen. Email Barb at [email protected] with Featured Animal Teacher Request in the subject line. Include their picture, their name, and your request. If your pet is chosen, your promise is to be available to offer feedback to students who post communication with them, AND, be on the next Live Q&A Call when we do the group communication with your pet! Once we’ve received your request, I’ll talk to all the pets first to be sure they want to do this. We’ll choose which one to award the honor to and let you know! These practice opportunities are designed to help you improve your accuracy, broaden your experience and develop your skills! I hope so because we want to talk to your pet(s) too! How can I add my pet to the Animal Teacher page? 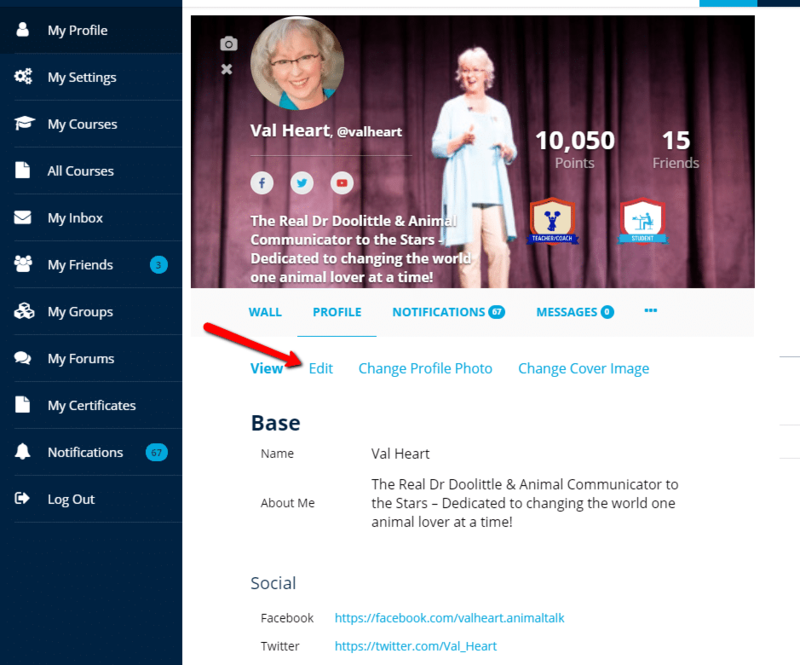 The Animal Teachers page is in the left column menu and is designed for the Animal Talk Coaching Club members who are able to access and participate in the Forum discussions directly. If you are a new Club member: Our moderator Barb posts pets onto the new Animal Teacher page as fast as she can without swamping the system. Look for them, okay? When you see them, be sure to post something to help your fellow students get started. If your pet(s) are NOT in it already, OR, you have pet additions, changes or updates, then email their picture to Barb so she can post them on the Animal Teacher page. –> Here’s How to Have Your Pet Included: Send Pictures! Email a picture of your animal(s) with your name and your animal’s name to [email protected] with the subject: Animal Teacher Picture. Pictures are accepted by email in jpg format only. Pictures submitted in other formats or in the Forum may be rejected. NOTE: Please don’t send enormous files, it clogs up the inbox. Your pictures should be no larger than 1MB in size, and each email with attachments should not exceed 3MB. If you have more pictures, then send them separately. If you feel tech challenged and need help, then just ask us, okay? We’re here to help. If you attach more than one picture to an email, include the animals’ names in the file names to avoid confusion in associating the animal’s name with the picture. Images will be cropped if necessary and reduced in size to fit on the page. If you drop out of the Club or are no longer in good standing as a member (haven’t paid your dues), then your animals will be removed from the list. Permissions! By playing you are granting permission for other students to communicate with your animal(s). Be Active! You are promising to be active on the Forum so you can provide appropriate feedback when someone posts a communication. There’s nothing so discouraging as gathering up the courage to try to communicate and then share what you got… but not hear anything back from the animal’s person to validate or correct your attempt. You wouldn’t like it, so don’t do that. Show up and play! 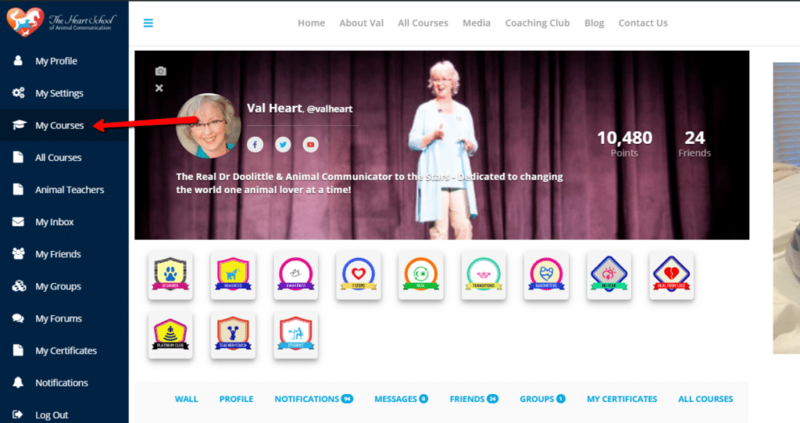 How can I earn sessions with Val in the Animal Talk Coaching Club Accountability practice games? Once you’re logged into your student account, go to My Forums https://learnhowtotalktoanimals.com/forums/forum/coaching-club-forum/ and find the post titled: Practice Accountability and Earn Bonus Time (Current Week). You’ll find instructions there. Accountability rewards are for Gold and Platinum members only. How can I find the Animal Talk Coaching Club Intuitive Games? Once you’re logged into your student account, go to My Courses and click on the Club. Look in the Welcome and Resources Modules. You’ll find instructions there. How do I practice communicating with the Featured Animal Teacher? Once you’re logged into your student account, go to My Forums and look to the upper right column to find the current Featured Animal Teacher. Click the Discussion button below the picture. You’ll find instructions there. This is for Animal Talk Coaching Club Students only. How do I talk to the animal teachers? Click on Animal Teachers on the left menu. Review the instructions. Choose a pet that “calls to you” or that you feel drawn to, and begin the conversation! If you are a Club member, then click the Button below the picture to join the Discussion in the Forum and add what you got! How and why should I practice accountability? 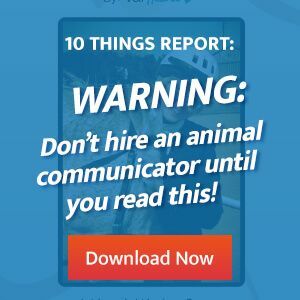 One of the most important things to help you stay on track with your goals in learning how to communicate with animals is to be accountable to your practice on a regular basis. To help you with that, the Animal Talk Coaching Club members are eligible to participate and earn rewards for doing so. This practice is designed to help you become more consciously aware of your journey, to celebrate your successes and share any perceived “failures” so they can be acknowledged, healed and cleared. Mistakes are a necessary part of the journey. There are no right answers here and this is not a test. Just do your best. Doing this exercise will help you improve your skills and be more consciously aware at all times. Remember this is a journey, not a destination. The idea is for you to stay conscious and make progress. NOTE: Animal Talk Coaching Club Gold and Platinum Club Members are Eligible to Earn the Accountability Bonus Call Award (a live small group coaching session with Val and the month’s other Accountability Bonus Award winners). 1) Stay Accountable. Each week there will be a new Accountability Discussion for the time period of Saturday through Friday to which you can post any day of the week. You are invited to report on you efforts, progress and frustrations during the week since your last post. You don’t have to have perfect results. It is more important that you are trying, taking action and sharing what’s happening for you. 3) In the Congratulations email, you’ll receive instructions on how to participate. Use your time for animal communication mentoring, healing, and/or Val’s help working with your own animal(s). 4) Post each week during the Saturday to Friday timeframe. All posts are automatically time stamped and should align with the appropriate week to apply toward earning a free session with Val. Note: You can’t wait for 3 months then do 12 week’s worth of reporting in 1 week! Having the practice over time will strengthen your Animal Communication muscles. Note: Silver members may upgrade to Gold or Platinum membership at any time by emailing [email protected] and letting us know. While only posts answering the above questions count as Accountability Posts, you are welcome to comment on anyone else’s posts. We are here to learn from and inspire each other too! Provide feedback to others and we will learn together. I have questions and would like coaching. How can I do that?